M. de Phocas – WHAT IS JAMES WEARING? When Scott McBee and I returned from Portugal the New York Season was already in full swing, so we wasted no time securing our tickets to Puccini’s Chinoiserie confection, Turandot. It’s one of the remaining productions designed by Franco Zeffirelli, and as expected it was an absolute dream! 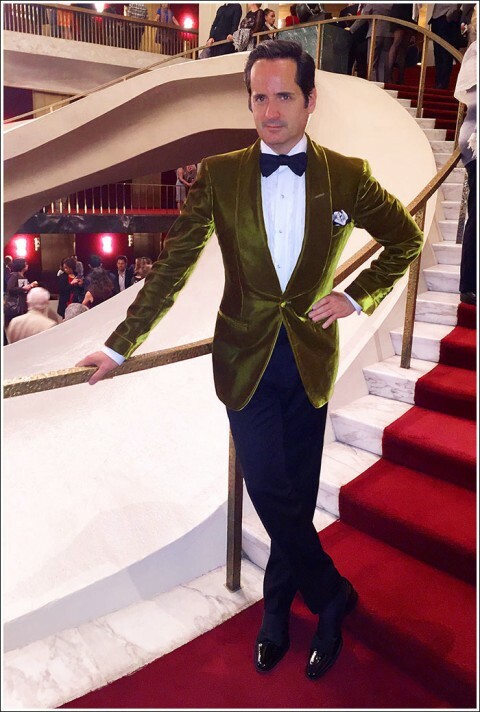 Going to the opera is a special thing; musicians, and all the staff at the MET are dressed in formal attire. Which begs the question: why should’t all the patrons and attendees be dressed in anything less? Mcbee and I dressed in black tie of course, but we were appalled to see that less than 10% of the men atteneding wore black tie (women on the whole, were dressed quite nicely – thank you ladies). We’ve ranted about this in the past (see: Dress Code Please) It was all jeans, shorts etc., that time — as if folks were going to the local cineplex. We just can’t say it enough — this is simply unacceptable — the Met should have higher standards, and this should apply to all of the performing arts venues, as well as fine restaurants! I’ve been accused of being an elitist, but we’re not talking about some sort of slavish adherence to traditions of the past. Our point is more about dressing appropriately to celebrate an elevated event, and having enough respect for ourselves and others to make some modicum of effort! Furthermore. as you know, we here at WIJW are even open to interesting variations on the theme. At the opening gala for example, we were rather taken by Miguel Angel Guzman and his ravishing ensemble: an elegant interpretation of the Kimono – it was perfectly appropriate AND alternative. Bravo! There was a lovely young lady dressed in a vintage 1950’s ensemble — also quite stunning. It doesn’t have to be Tom Ford to be fabulous. In any case, I really do wish the Met would get on board with this, and start to require guests to dress appropriately. To celebrate this amazing evening, (top) I’m sporting a Tom Ford chartreuse silk velvet dinner jacket, tuxedo pants, black silk faille bow tie, black and ivory silk pocket square and Tom Ford era Gucci white cotton voile ruffle and lace trimmed tuxedo shirt, a diamond evening set by M. de Phocas, Paul Stuart black silk evening hose, Creed Imperial Millesime fragrance, and a bit of Tom Ford Bronzing Gel to add a sun-kissed glow. James Andrew – M. de Phocas evening set. When dressing for a gala (like the Lenox Hill Neighborhood House Spring Gala we’ll be featuring in our next post), I prefer to stand out in the inevitable sea of black tuxedos. My thinking is, women get to have so much fun with dresses, gowns, and jewelry, why shouldn’t gentleman have a bit more fun creating fabulous formal ensembles?! The fact is, I don’t even own a traditional tuxedo! 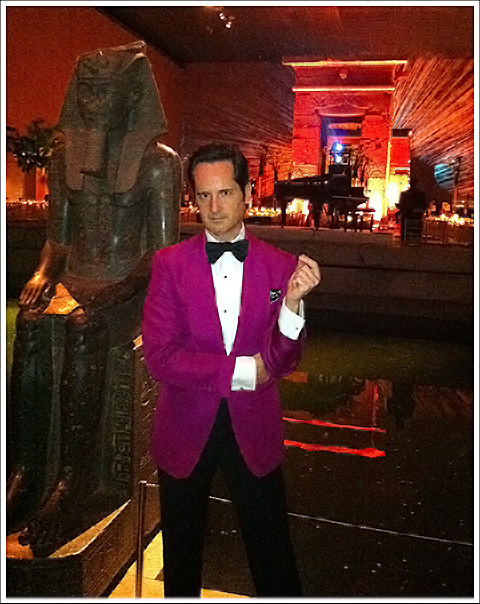 Instead I opt for wonderful dinner jackets and/or select tuxedo shirts in gorgeous colors, perhaps a pale pink, mauve, or mint green one. Beyond that — but no-less important — is the selection of an evening set: the detail that really gives men the opportunity to express their elegant individuality. My go-to resource has become M. de Phocas. I consider them to be the modern day Vedura or Seaman Schepps. 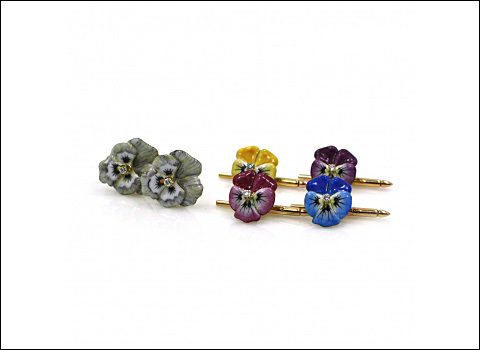 MdP gives an impossibly fresh and chic take on men’s and women’s accessories. 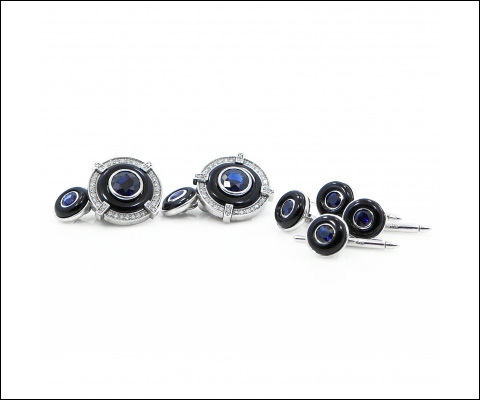 With their exquisite eye, they are doing the most wonderfully whimsical things with their designs and materials. I highly suggest perusing their website or even better, go and meet with them to create something truly custom – I don’t think it gets any better than that. 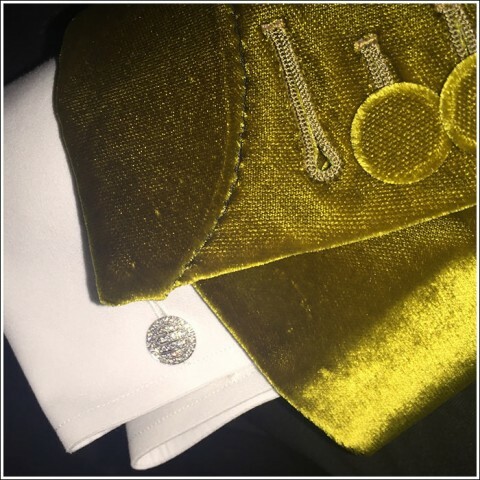 For the aforementioned gala, I wore an M. de Phocas Art Deco Diamond evening set with a Tom Ford magenta silk ottoman cloth dinner jacket, white cotton voile tuxedo shirt and a black silk faille bow tie – my fragrance? Creed Original Cologne. 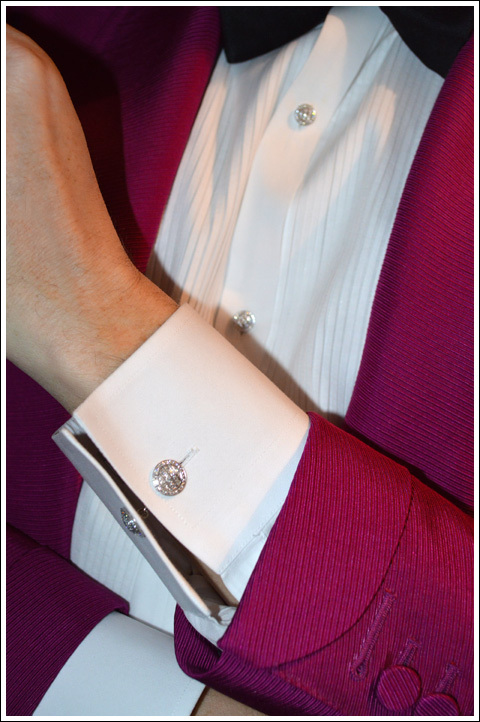 When I’m invited to one of the many black tie galas here in NYC, my go-to resource for the most exquisite evening sets is without question M. de Phocas. 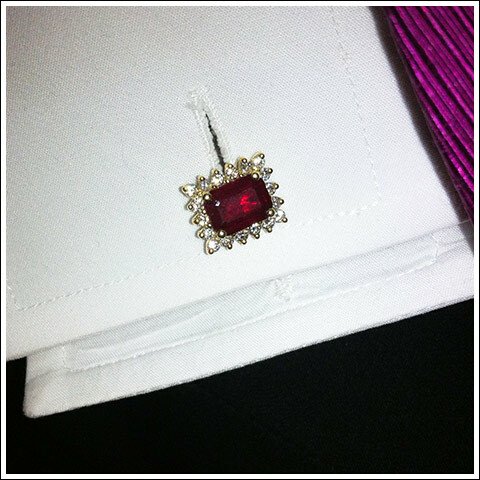 Their unique style and taste make me one of their most devout fans—and diamonds, rubies, and sapphires certainly have a way of bringing out my regal side! So when I’m attending a major event at the Temple of Dendur or some other equally happening bash, my friends at M. de Phocas are my first stop to ensure that I’m making an appropriate statement. 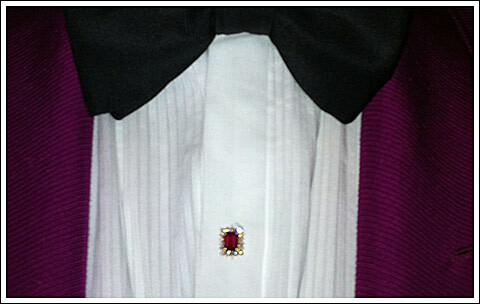 For this year’s “FARE” gala I’m sporting a Tom Ford magenta silk ottoman cloth dinner jacket and black silk faille bow tie, diamond and ruby evening set by M. de Phocas, Tom Ford era tuxedo shirt and pants, black patent opera pump, and my fragrance is Creed Imperial Milessime.